Mathematician pretending to be a software engineer. Working on accelerating machine learning on a range of hardware using the SYCL application model, primarily through actively contributing to the SYCL backend of Tensorflow and Eigen. Heads up: This site hasn't been updated much recently, so may contain information which is a little dated and inaccurate. I have finished my Phd, am no longer working in academia or teaching, and should hopefully have this updated sometime. 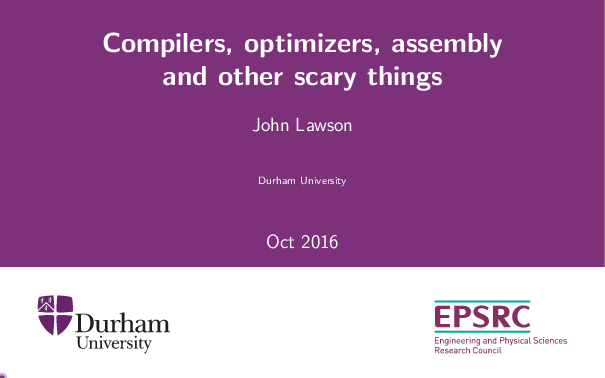 I recently gave a talk at the maths department informal computing seminar (link) on using the optimizers built into compilers to give a significant performance increase in code. After a trip to the US, I set about creating a video of the clips and photos from my time there. Having no experience of any video editing software I looked around for something free and open source, with Blender frequently coming up as a suggestion. Blender is best known for animating 3D models but also contains a fully functional video sequence editor (VSE). After a little while playing aroud with it, the one thing that really annoyed me about blender’s VSE was how it imported images. Unless the image you import is exactly the same size as the render target Blender will squash it and mangle it to that size. In the video I was looking to import a large portrait photo and pan from the bottom to the top, so I needed the image in its original aspect ratio and ideally at its full resolution. Initially I manually added transfrom layers to rescale the image back to its proper aspect ration, but quickly got bored of doing this and wrote an add-on to do it for me. Following the shock decision by the UK to leave the EU, many ideas were put forward as to the reasons behind why so many people voted the ways that they did. In an effort to learn more about data handling in python, using pandas, matplotlib and other fun stuff I scoured the internet for data and set about plotting graphs. Theme based on Jason Long's Architect theme.